This article is about the basketball player. For the football coach, see Paul Pierce (American football). Pierce was a high school McDonald's All-American and earned consensus first-team All-America honors in his junior year at Kansas. After being chosen by the Boston Celtics with the 10th overall pick in the 1998 NBA draft, Pierce spent the first 15 years of his career with Boston. Pierce's nickname, "The Truth", was given to him by Shaquille O'Neal in March 2001. He starred as captain of the Celtics, earning 10 All-Star nods and becoming a four-time All-NBA team member. Pierce combined with Kevin Garnett and Ray Allen in 2007 to form a "Big Three" that led Boston to two NBA Finals and an NBA championship in 2008. Pierce was named NBA Finals Most Valuable Player in 2008. Along with Larry Bird and John Havlicek, Pierce is one of only three players to have scored more than 20,000 career points with the Celtics. 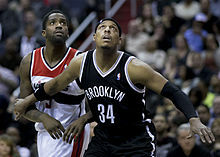 In July 2013, Pierce was traded to the Brooklyn Nets along with teammates Kevin Garnett and Jason Terry. He signed with the Washington Wizards as a free agent in 2014. After one season with the Wizards, Pierce reunited with former Celtics coach Doc Rivers and signed with the Clippers. He spent two seasons with the Clippers before retiring in 2017. On July 17, 2017, the Celtics signed Pierce to a contract, enabling him to retire as a member of the organization with which he spent his first 15 NBA seasons. Pierce was born and raised in Oakland, California. His family later moved to Inglewood, California, where he attended Inglewood High School. He was cut from Inglewood High's varsity basketball team his freshman and sophomore years, and seriously thought about transferring before spending extra time in the gym and becoming the star of the team by the end of his junior year. Pierce went on to participate in the 1995 McDonald's All-American Game alongside future NBA stars Kevin Garnett, Vince Carter, Stephon Marbury, and Antawn Jamison, and was a contestant in the game's Slam Dunk Contest, which was won by Carter. He grew up a Los Angeles Lakers fan and dreamed of playing for the team. In 2012, Pierce was honored as one of the 35 Greatest McDonald's All-Americans. Pierce spent three years at Kansas between 1995 and 1998. He earned honorable mention All-Big Eight honors and was selected second team Freshman All-American by Basketball Weekly. He was also honored as the Big Eight Co-Freshman of the Year with Colorado's Chauncey Billups. During summer of 1996, Pierce earned a spot on the roster of the USA's Under 22 team and helped USA go unbeaten in the World Championship-qualifying tournament in Puerto Rico. As a sophomore, Pierce captured the first of two Big 12 Conference Tournament Most Valuable Player awards after averaging 21.7 points and guiding Kansas to the inaugural tournament championship. As a junior in 1997–98, Pierce won Most Valuable Player honors in both the Preseason NIT and the Big 12 Conference Tournament. He was selected First Team All-Big 12 Conference by both the AP and Coaches, and was named Associated Press First Team All-American and a finalist for the 1998 John Wooden and Naismith awards. He scored 777 points as a junior—the fifth-most single-season point total in Jayhawks history. He ranks as the fifth-leading scorer in Kansas history (1,786 points) and 11th on the all-time rebounds list (676). Pierce left the University of Kansas following his junior season and entered the 1998 NBA draft. Pierce attempting a dunk in January 2000. Pierce was selected with the 10th overall pick in 1998 NBA draft by the Boston Celtics, a team he despised growing up. A starter from the get-go, he scored 19 or more points in 10 of his first 11 contests, and was on his way to being one of the best young players in the game. For the year, he averaged 16.5 points and finished third in the voting for Rookie of the Year honors. In his second season, he raised his scoring average to 19.5 points per game, and was turning into one of the elite offensive players in the NBA. By his third season in the league, Pierce was ready for a breakout year. In the 2000–01 season, Pierce appeared in 82 games (all starts), averaging 25.3 points, 6.4 rebounds, 3.1 assists and 1.68 steals in 38.0 minutes. He led the Celtics and finished eighth in the league in points per game, fourth in total points (2,071). He was named NBA Player of the Month for March 2001 after averaging 30.3 points, 7.2 rebounds, 3.4 assists and 1.60 steals for the month. In the 2001–02 season, Pierce was named Eastern Conference Co-Player of the Month twice, for December and April. That season, Pierce led the Celtics to the playoffs for the first time in seven years and on to the Eastern Conference Finals. In Game 3 of the conference finals, the Celtics pulled off the greatest fourth-quarter comeback in NBA playoff history, with Pierce scoring 19 of his 28 points in the final 12 minutes as Boston overcame a 21-point deficit to beat the New Jersey Nets 94–90. The win gave the Celtics a 2–1 advantage in the series; however, the Nets went on to win the series in six games. From 2002 to 2006, Pierce made the All-Star team every season. He led the league in total points (2,144) in 2002 and was an All-NBA Third Team selection in 2002 and 2003. He was also selected as a member of the US national team in 2002 and played in the FIBA World Championships. But while Pierce was achieving astounding personal success, the Celtics as a franchise was stumbling. In the 2006–07 season, Boston finished with 24 wins—second-worst record in the NBA—and Pierce played only 47 games due to injury. Prior to the 2007–08 season, the Celtics acquired the services of fellow NBA All-Stars Ray Allen and Kevin Garnett. The pair combined with Pierce to form a "Big Three". The Celtics completed the largest single-season turnaround in NBA history, with the "Big Three" leading Boston to 66 wins in the regular season, a 42-game improvement. However, the team struggled initially in the playoffs. The Atlanta Hawks took them to seven games in the first round, as did the Cleveland Cavaliers in the conference semifinals. In Game 7 of their series against the Cavaliers, Pierce racked up the second most Game 7 points in franchise history with 41 as the Celtics edged the Cavaliers to advance to the Eastern Conference Finals. The Celtics went on to defeat the Detroit Pistons in six games in the Eastern Conference Finals, winning two road games. On June 5, 2008, in Game 1 of the 2008 NBA Finals against the Los Angeles Lakers, Pierce was injured in the third quarter and was carried off the court in serious pain. However, he came back to the court only a few minutes later to spark the Celtics with 15 points in the third quarter en route to a 98���88 victory. He went on to lead the Celtics to their 17th championship with a 4–2 series victory over the Lakers. Pierce was named the NBA Finals Most Valuable Player after averaging 22 points per game over the six-game series. Not long after winning the championship, Pierce was asked, "Is Kobe [Bryant] really the best player in the world?" Pierce responded by saying, "I don't think Kobe is the best player. I'm the best player. There's a line that separates having confidence and being conceited. I don't cross that line but I have a lot of confidence in myself." The quote drew minor controversy. 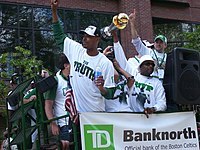 Pierce and the Celtics looked to repeat as world champions during the 2008–09 NBA season. Pierce missed only one game the entire season and led the team in scoring. He was named to the 2009 NBA All-Star Game and for the first time to the All-NBA Team Second Team. Despite Pierce's success, with Kevin Garnett injured, the Celtics lost in the second round of the 2009 NBA Playoffs. At the 2010 NBA All-Star Game at Cowboys Stadium in Arlington, Texas, Pierce became the first Celtic since Larry Bird to win the Three-Point Shootout. In game 3 of the first round between the Celtics and Miami Heat in the 2010 NBA Playoffs, Pierce hit a 21-foot jumper at the buzzer to beat Miami 100–98, and give the Celtics a 3–0 series lead. The Celtics went on to win that series, and also defeated the heavily favored Cavaliers in the second round. They faced the Orlando Magic in the Eastern Conference Finals, and beat them in 6 games to advance to their second Finals appearance in the Big 3 era. They faced off against the Lakers in a rematch of the 2008 NBA Finals, and took a 3–2 lead heading back to Los Angeles. However, in spite of Rasheed Wallace more than making up for the loss of injured center Kendrick Perkins, the Celtics were blown out in game 6 and lost a 13-point second half lead in game 7, losing the deciding game 83–79. On June 29, 2010, Pierce opted out of his contract and invoked his early termination clause to become an unrestricted free agent on July 1, 2010. However, on July 2, Pierce and the Celtics verbally agreed to a four-year extension keeping him in Boston through the 2013–14 season. On November 3, 2010, during a game against the Milwaukee Bucks, Pierce scored his 20,000th career point on a free throw, becoming the third player in Celtics history to reach that milestone solely in a Celtics uniform. The Celtics finished the season with the number 3 seed in the Eastern Conference and swept the New York Knicks in the first round of the playoffs. In the second round, the Celtics took on the Miami Heat and their big three of LeBron James, Dwyane Wade, and Chris Bosh. The Celtics lost to Miami, who eventually moved on to the NBA Finals, in five games. On February 7, 2012, during a game against the Charlotte Bobcats, Pierce scored fifteen points to pass Larry Bird for second place on the Boston Celtics' all-time scoring list. He was named to his tenth NBA All-Star appearance on February 9, 2012. He then played his 1,000th career game with the Celtics on March 9, 2012, against the Portland Trail Blazers; only Pierce, John Havlicek, and Robert Parish have played in over 1,000 career games for the Celtics. For the 2011–12 season Pierce averaged 19.4 points, 4.5 assists, and 5.2 rebounds per game as the Celtics finished the season 39–27 in the lockout shortened season. In the playoffs, the Celtics beat the Hawks in six games in the first round, as Pierce averaged 21.2 points per game during the series. In the conference semifinals the Celtics faced the Philadelphia 76ers led by Doug Collins. They pushed the Celtics into a full seven game series, but the Celtics won the final game 85–75. The Celtics then played the Miami Heat in the conference finals. Pierce hit a crucial 3-pointer over LeBron James in game 5 to take a series lead of 3–2, but the Celtics lost the last two games, and the Heat advanced to the NBA Finals. Pierce finished the playoffs averaging 18.9 points per game while shooting only 38.6 percent from the field and 31 percent from three. The 2012–13 season did not go as planned for Celtics, with All-Star point guard Rajon Rondo out with a torn ACL injury. On January 27, 2013, against the Miami Heat, Pierce recorded his first triple-double of the season with 17 points, 13 rebounds, and 10 assists. On February 10, 2013, against the Denver Nuggets, Pierce recorded his second triple-double of the season with 27 points, 14 rebounds, and 14 assists becoming the oldest player, in a game of any length, to record at least 20 points, 12 rebounds, and 12 assists (previously held by Larry Bird). On March 29, 2013, against the Atlanta Hawks, Pierce recorded his third triple-double of the season with 20 points, 10 rebounds, and 10 assists. Pierce finished the 2012–13 season with season averages of 18.6 points, 6.3 rebounds, and 4.8 assists per game while the Celtics managed to clinch the 7th seed in the playoffs with a 41–40 season record (with one game not played because of the Boston Marathon bombings). The Celtics lost to the New York Knicks in the 1st round in six games. Pierce averaged 19.2 points per game while shooting a poor 36.8 percent from the field and 26.8 percent from three-point range along with 5.7 rebounds and 5.3 assists in the playoff series loss. On June 28, 2013, the day of the NBA draft, the Boston Celtics and Brooklyn Nets reached a deal to trade Pierce, Kevin Garnett, and Jason Terry for future first-round picks in the 2014, 2016, and 2018 drafts and Kris Humphries, Gerald Wallace, Kris Joseph, MarShon Brooks, and Keith Bogans. The deal was completed on July 12, 2013. Brooklyn also received D. J. White. Pierce convinced Garnett to waive his no-trade clause so that the deal could come to fruition. At an introductory press conference with Garnett and Terry following the trade, Pierce stated, "We are championship driven... We made a lot of money in our careers. We have won a number of awards. At this point right now, we are about winning a championship. Brooklyn gives us the best opportunity." In 2013–14, Pierce appeared in 75 games (including 68 starts), averaging 13.5 points, 4.6 rebounds and 2.4 assists in 28.0 minutes. He scored 1,000 points for the 15th straight season, becoming the only active NBA player and the sixth player in NBA history (along with Kareem Abdul-Jabbar, Karl Malone, John Havlicek, Elvin Hayes, Robert Parish) to score 1,000 points in 15 straight seasons. He passed Allen Iverson and Patrick Ewing on the NBA's all-time scoring list (moving up to 18th in NBA history), moved into fifth place in all-time NBA history with 1,935 career three-pointers made, and had his most steals (86) in a season since 2007–08. On April 11, 2014 against Atlanta, Pierce became the fourth active player (along with Kobe Bryant, Dirk Nowitzki and Garnett) and the 18th player in NBA history to score 25,000 career points. Prior to the season, the Nets were thought to be contenders to win the Eastern Conference. Pierce and Garnett were set to be the supporting cast to Deron Williams, Joe Johnson, and Brook Lopez. After scrapping past the Toronto Raptors in the first round of the playoffs thanks to a last-second block from Pierce in Game 7, their attempt to get past the Heat and win a championship fell short. They lost to Miami in five games in the second round. On July 17, 2014, Pierce signed a two-year, $11 million contract with the Washington Wizards. With 14 points against the Atlanta Hawks on November 25, 2014, Pierce passed Jerry West for 17th place on the NBA's career scoring list. Two weeks later, Pierce passed Reggie Miller for 16th place on the NBA's career scoring list with a season-high 28 points against the Boston Celtics. On January 14, 2015, Pierce passed Jason Kidd for fourth all-time in three-pointers made in a 105–99 win over the Chicago Bulls. Eleven days later, he recorded his 2,000th career three-pointer in a 117–115 overtime win over the Denver Nuggets. On February 2, 2015, he passed Alex English for 15th place on the NBA's career scoring list with 11 points against the Charlotte Hornets. Pierce finished the regular season averaging 11.9 points per game, a career low. On May 9, 2015, Pierce made a two-point shot with three defenders on him at the buzzer to defeat the Atlanta Hawks 103–101 and take a 2–1 series lead in the Eastern Conference semi-finals. He finished the game with 13 points and 7 rebounds. In Game 6 of the series on May 15, the Wizards were down 94–91 with seconds remaining when Pierce launched a three-pointer, hoping to extend the Wizards' season by forcing overtime. The shot swished, apparently tying the score at the buzzer, but the play was reviewed, showing the clock expired before Pierce released the basketball. On June 27, 2015, Pierce opted out of the second year of his contract with the Wizards to become a free agent. On July 10, 2015, Pierce signed a three-year, $10 million contract with the Los Angeles Clippers. He made his debut for the Clippers in the team's season opener against the Sacramento Kings on October 28, recording 12 points and 7 rebounds off the bench in a 111–104 win. With Lance Stephenson starting at small forward, Pierce began the season as a role player off the bench for the first time in his career. On December 16, Pierce scored six points against the Milwaukee Bucks. In the game, he hit a buzzer beater to end the first quarter and became the fifth active player and 16th in NBA history to reach 26,000 points. On September 26, 2016, Pierce announced that the 2016–17 season would be his last in the NBA. In what would be his last game in Boston, on February 5, 2017, Pierce started and played the first five minutes before heading to the bench—it was his first appearance for the Clippers since New Year's Eve. Although the crowd chanted his name in the final minutes, Pierce did not re-enter the game until there was 19 seconds left; he hit a three-pointer to finish the game for his only points of the contest. On April 10, 2017, he scored all of his 10 points in the final five minutes of the Clippers' 125–96 win over the Houston Rockets. He subsequently moved into 15th on the NBA career scoring list with 26,397 points. The Clippers finished the regular season with a 51–31 record and entered the playoffs as the No. 4 seed. They went on to lose their first-round playoff series to the Utah Jazz in seven games, as Pierce's 19-year NBA career came to an end at the final buzzer of Game 7 on April 30, 2017. In his final game, he had six points and three rebounds in 21 minutes, and averaged 11.1 minutes in the series. On June 28, 2017, he was waived by the Clippers. On July 17, 2017, Pierce signed a ceremonial contract with the Boston Celtics in order to retire with the team. On August 18, 2017, the Celtics announced Pierce's jersey would be retired on February 11, 2018. His jersey was raised to the rafters of TD Garden in a postgame ceremony following the Celtics-Cavaliers game, as he became the 23rd person in Celtics history to be honored. Pierce was a member of the United States national team for the 2002 FIBA World Championship, starting all nine games and averaging 19.8 points per game. Pierce was also selected for the United States national team for the 2006 FIBA World Championship, but did not compete because of minor off-season surgery. Pierce and his wife Julie (née Landrum) have three children; two daughters, Prianna and Adrian, and a son, Prince. On September 25, 2000, Pierce was stabbed 11 times in the face, neck, and back and had a bottle smashed over his head while at the Buzz Club, a late night dance club in the Boston Theater District. He had to undergo lung surgery to repair the damage. Nevertheless, Pierce was the only Celtic to start all 82 games in the 2000–01 season. Tony Battie, Pierce's teammate at the time, along with Battie's brother, saved him by rushing him to a nearby hospital. In 2003, two and a half years after the attack, Pierce pledged $2.5 million to help expand the high-tech surgical center at Tufts-New England Medical Center that helped make his recovery possible. Pierce stated, "This is an opportunity for me to give back to the hospital that was there for me when I needed it." In August 2018, Pierce discussed battling depression for a year after his stabbing, revealing that he dealt with paranoia over crowds and post-traumatic stress stemming from the incident. He divulged this information as part of the NBA's initiative to focus on the mental health of its players. Pierce's nickname, "The Truth", was bestowed on him by Shaquille O'Neal after a 112–107 Lakers' victory over the Celtics on March 13, 2001, in which Pierce scored 42 points on 13-of-19 shooting. O'Neal pulled Boston Herald reporter Steve Bulpett over and gestured toward his notepad. "Take this down", said O'Neal. "My name is Shaquille O'Neal and Paul Pierce is the motherfucking truth. Quote me on that and don't take nothing out. I knew he could play, but I didn't know he could play like this. Paul Pierce is The Truth." Most points scored in a half (including Overtime): 46 (December 1, 2001 2nd Half vs. New Jersey Nets). Most free throws made in one game: 20 (November 2, 2002 vs. New York Knicks). Most free throws attempted in one game: 24 (November 5, 2005 vs. New York Knicks). Most free throws made in one half: 14 (March 2, 2001 vs. Utah Jazz). Most steals in one game: 9 (tied with Larry Bird; December 3, 1999 vs. Miami Heat). Highest scoring average through one month: 33.5 PPG (February 2006). ^ "2010 NBA Finals: Los Angeles' greatest player? It's Paul Pierce". ESPN.com. Retrieved July 11, 2015. 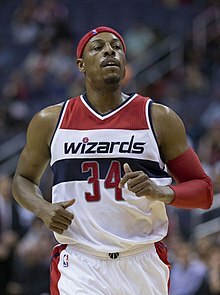 ^ a b c d "Paul Pierce stats, details, videos, and news". NBA.com. Archived from the original on May 17, 2017. Retrieved May 17, 2017. ^ Turner, Broderick (February 4, 2017). "Clippers' Paul Pierce braces himself for what figures to be an emotional final game in Boston". LATimes.com. Retrieved May 17, 2017. ^ "BIOGRAPHY". PaulPierce.net. Retrieved May 17, 2017. ^ "Colossal collapse: Nets allow Celtics to pull off biggest comeback ever". SportsIllustrated.cnn.com. May 25, 2002. Archived from the original on June 5, 2002. Retrieved November 11, 2008. ^ "Celtics Top Game 7 Scoring Performances". NBA.com. May 18, 2008. Retrieved May 17, 2017. ^ Mark Murphy, Injured Paul Pierce keys Game 1 win, Boston Herald, June 6, 2008. ^ Couper Moorhead, Showing Heart, Pierce Recovers from Wounded Knee To Bury Lakers, Celtics.com, June 6, 2008. ^ Michael Vega, Pierce felt pain, hurt Lakers, The Boston Globe, June 6, 2008. ^ "Paul Pierce says he's the best player in the world". sports.yahoo.com-J.E. Skeets. Retrieved May 16, 2010. ^ "Clutch shooting in finals leads Pierce to Three-Point win". nba.com-Scott Howard-Cooper. Retrieved May 16, 2010. ^ "After Game 3 drama, Celtics 1 win from a sweep". sports.yahoo.com-TIM REYNOLDS. Retrieved May 16, 2010. ^ "Analysis: Pierce opts out – Boston Celtics Blog – ESPN Boston". espn.go.com. Retrieved September 6, 2014. ^ "Reports: Pierce agrees to 4-year deal". ESPN.com. Retrieved July 2, 2010. ^ Pierce score 20,000th point in overtime win Archived November 4, 2010, at the Wayback Machine, theglobalmail.com November 4, 2010, accessed November 4, 2010. ^ "Nets, Celtics work out blockbuster". ESPN.com. June 28, 2013. Retrieved June 28, 2013. ^ "Pierce convinced Garnett to drop his no-trade clause". Sporting News. Retrieved July 11, 2015. ^ "New Nets driven to bring title to Brooklyn". The Brooklyn Paper. Retrieved July 11, 2015. ^ "Notebook: Hawks 93, Nets 88". NBA.com. April 11, 2014. Retrieved May 1, 2017. ^ Puccio, Anthony (May 29, 2014). "Brooklyn Nets 2013-2014 Player Review: Paul Pierce". NetsDaily.com. Retrieved May 1, 2017. ^ "Wizards Sign Paul Pierce". NBA.com. July 17, 2014. Retrieved July 17, 2014. ^ "Paul Pierce to Wizards on 2-year deal". ESPN.com. July 13, 2014. Retrieved July 17, 2014. ^ "Hawks top Wizards 106-102 for 6th win in 8". NBA.com. November 25, 2014. Retrieved November 25, 2014. ^ "Wall helps Wizards outlast Celtics 133-132 in 2 OT". NBA.com. December 8, 2014. Retrieved December 9, 2014. ^ Castillo, Jorge (January 14, 2015). "Paul Pierce passes Jason Kidd for fourth all-time in three-pointers made". WashingtonPost.com. Retrieved January 26, 2015. ^ "Video: Paul Pierce Hits 2,000th 3-Pointer Of Career, Lets Crowd Know About It". DimeMag.com. January 25, 2015. Retrieved January 26, 2015. ^ Helin, Kurt (January 25, 2015). "Paul Pierce hits 2,000th three pointer of career (VIDEO)". NBCSports.com. Retrieved January 26, 2015. ^ "Jefferson has 18 and 12; Hornets stay hot, top Wizards 92-88". NBA.com. February 2, 2015. Retrieved February 3, 2015. ^ "Pierce's buzzer-beater lifts Wiz past Hawks 103-101". NBA.com. May 9, 2015. Retrieved May 9, 2015. ^ "Pierce's shot too late, Hawks hold on to beat Wizards 94-91". NBA.com. May 15, 2015. Retrieved May 15, 2015. ^ Castillo, Jorge (June 27, 2015). "Paul Pierce is opting out of contract to become free agent, Wizards confirm". WashingtonPost.com. Retrieved June 27, 2015. ^ "Clippers Sign Paul Pierce". NBA.com. July 10, 2015. Retrieved July 10, 2015. ^ "Paul Pierce comes home to Los Angeles to play for Clippers". Yahoo.com. July 10, 2015. Retrieved July 10, 2015. ^ "Griffin leads Clippers past Kings 111-104 in opener". NBA.com. October 28, 2015. Retrieved October 28, 2015. ^ "Paul scores 21 points, Clippers beat Bucks 103-90". NBA.com. December 16, 2015. Retrieved December 17, 2015. ^ "My Final Season". ThePlayersTribune.com. September 26, 2016. Retrieved September 26, 2016. ^ "Celtics say goodbye to Pierce, beat Clippers 107-102". ESPN.com. February 5, 2017. Retrieved February 5, 2017. ^ "Pierce Passes Havlicek on All-Time Scoring List . . . at Age 54?". CSNNE.com. April 11, 2017. Retrieved April 13, 2017. ^ "Clippers rout Rockets 125-96, tied with Utah for 4th seed". ESPN.com. April 10, 2017. Retrieved April 10, 2017. ^ "Jazz sink Clippers in 7 for first postseason series win since 2010". ESPN.com. April 30, 2017. Retrieved April 30, 2017. ^ "Paul Pierce says goodbye after a 19-year NBA career". NBA.com. April 30, 2017. Retrieved May 1, 2017. ^ "Paul Pierce: Waived by Clippers". CBSSports.com. June 28, 2017. Retrieved July 17, 2017. ^ "Paul Pierce Retires as a Boston Celtic". NBA.com. July 17, 2017. Retrieved July 17, 2017. ^ "Celtics will retire Paul Pierce's number on Feb. 11 vs. Cavs". BostonHerald.com. August 18, 2017. Retrieved August 18, 2017. ^ "Truth is: Cavaliers beat Celtics 121-99 on Paul Pierce's day". ESPN.com. February 11, 2018. Retrieved February 11, 2018. ^ Sarie. "PAUL PIERCE AND WIFE WELCOME FIRST SON". Black Celebrity Kids. Archived from the original on July 12, 2015. Retrieved July 11, 2015. ^ "ESPN.com – NBA – Two suspects arraigned". static.espn.go.com. Retrieved November 11, 2008. ^ Lena Williams (September 26, 2000). "PRO BASKETBALL; Nightclub Incident Leaves Celtic Recovering From Stab Wounds – New York Times". Query.nytimes.com. Retrieved November 11, 2008. ^ "Celtics Star Paul Pierce Fights Back On ''BEYOND THE GLORY'' | Celtics.com". Nba.com. Retrieved November 11, 2008. ^ "Celtics star pledges $2.5 million to the hospital that saved his life". tuftsjournal.tufts.edu. Retrieved May 9, 2015. ^ MacMullan, Jackie (August 20, 2018). "The courageous fight to fix the NBA's mental health problem". ESPN.com. Retrieved August 21, 2018. ^ Paul Pierce ESPN Story about his nickname "The Truth"
^ "USA Basketball – Oops, 404 Error!". usabasketball.com. Archived from the original on July 14, 2007. Retrieved July 11, 2015. ^ "NBA.com - Celtics' Pierce Wins Community Award". www.nba.com. Retrieved 2019-02-16. ^ a b c d e "Boston Celtics Career Leaders". Basketball-Reference.com. Retrieved June 24, 2011. ^ a b "Boston Celtics Season Leaders". Basketball-Reference.com. Retrieved June 24, 2011. Wikimedia Commons has media related to Paul Pierce.